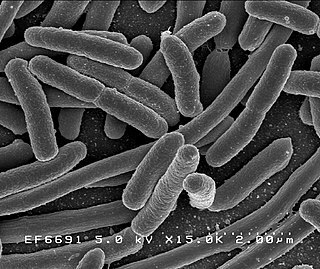 Pathogenic bacteria are bacteria that can cause disease. This article deals with human pathogenic bacteria. Although most bacteria are harmless or often beneficial, some are pathogenic, with the number of species estimated as fewer than a hundred that are seen to cause infectious diseases in humans. By contrast, several thousand species exist in the human digestive system. In biology, a pathogen is also known as an infectious agent, or a germ. In the oldest and broadest sense, a pathogen is anything that can produce disease; the term came into use in the 1880s. Typically the term pathogen is used to describe an infectious microorganism or agent, such as a virus, bacterium, protozoan, prion, viroid, or fungus. Small animals, such as certain kinds of worms and insect larvae, can also produce disease but such animals are usually, in common parlance, referred to as parasites rather than pathogens. The scientific study of microscopic, pathogenic organisms is called microbiology, while the study of disease that may include these pathogens is called pathology. Parasitology, meanwhile, is the scientific study of parasites and the organisms that host them. Disease burden is the impact of a health problem as measured by financial cost, mortality, morbidity, or other indicators. It is often quantified in terms of quality-adjusted life years (QALYs) or disability-adjusted life years (DALYs), both of which quantify the number of years lost due to disease (YLDs). One DALY can be thought of as one year of healthy life lost, and the overall disease burden can be thought of as a measure of the gap between current health status and the ideal health status. According to an article published in The Lancet in June 2015, low back pain and major depressive disorder were among the top ten causes of YLDs and were the cause of more health loss than diabetes, chronic obstructive pulmonary disease, and asthma combined. The study based on data from 188 countries, considered to be the largest and most detailed analysis to quantify levels, patterns, and trends in ill health and disability, concluded that "the proportion of disability-adjusted life years due to YLDs increased globally from 21.1% in 1990 to 31.2% in 2013." The environmental burden of disease is defined as the number of DALYs that can be attributed to environmental factors. These measures allow for comparison of disease burdens, and have also been used to forecast the possible impacts of health interventions. By 2014 DALYs per head were "40% higher in low-income and middle-income regions." Koch's postulates are the standard to establish a causative relationship between a microbe and a disease. Koch's postulates are four criteria designed to establish a causative relationship between a microbe and a disease. The postulates were formulated by Robert Koch and Friedrich Loeffler in 1884, based on earlier concepts described by Jakob Henle, and refined and published by Koch in 1890. Koch applied the postulates to describe the etiology of cholera and tuberculosis, but they have been controversially generalized to other diseases. These postulates were generated prior to understanding of modern concepts in microbial pathogenesis that cannot be examined using Koch's postulates, including viruses or asymptomatic carriers. They have largely been supplanted by other criteria such as the Bradford Hill criteria for infectious disease causality in modern public health. Causality is what connects one process with another process or state, where the first is partly responsible for the second, and the second is partly dependent on the first. In general, a process has many causes, which are said to be causal factors for it, and all lie in its past. An effect can in turn be a cause of, or causal factor for, many other effects, which all lie in its future. Multiple philosophers have believed that causality is metaphysically prior to notions of time and space. Each species has specific effect and causes symptoms in people who are infected. Some, if not most people who are infected with a pathogenic bacteria do not have symptoms. Immuno-compromised individuals are more susceptible to pathogenic bacteria. Some pathogenic bacteria cause disease under certain conditions, such as entry through the skin via a cut, through sexual activity or through a compromised immune function. An abscess caused by opportunistic S. aureus bacteria. Streptococcus is a genus of gram-positive coccus or spherical bacteria that belongs to the family Streptococcaceae, within the order Lactobacillales, in the phylum Firmicutes. Cell division in streptococci occurs along a single axis, so as they grow, they tend to form pairs or chains that may appear bent or twisted. Staphylococcus is a genus of Gram-positive bacteria in the family Staphylococcaceae in the order Bacillales. Under the microscope, they appear spherical (cocci), and form in grape-like clusters. Staphylococcus species are facultative anaerobic organisms. An opportunistic infection is an infection caused by pathogens that take advantage of an opportunity not normally available, such as a host with a weakened immune system, an altered microbiota, or breached integumentary barriers. Many of these pathogens do not cause disease in a healthy host that has a normal immune system. However, a compromised immune system, which is seriously debilitated and has lowered resistance to infection, a penetrating injury, or a lack of competition from normal commensals presents an opportunity for the pathogen to infect. Immunosuppression is a reduction of the activation or efficacy of the immune system. Some portions of the immune system itself have immunosuppressive effects on other parts of the immune system, and immunosuppression may occur as an adverse reaction to treatment of other conditions. Cystic fibrosis (CF) is a genetic disorder that affects mostly the lungs, but also the pancreas, liver, kidneys, and intestine. Long-term issues include difficulty breathing and coughing up mucus as a result of frequent lung infections. Other signs and symptoms may include sinus infections, poor growth, fatty stool, clubbing of the fingers and toes, and infertility in most males. Different people may have different degrees of symptoms. 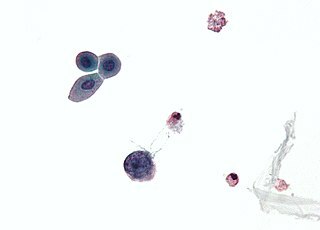 Obligate intracellular parasites (e.g. Chlamydophila, Ehrlichia, Rickettsia) have the ability to only grow and replicate inside other cells. Even these intracellular infections may be asymptomatic, requiring an incubation period. An example of this is Rickettsia which causes typhus. Another causes Rocky Mountain spotted fever. Chlamydophila is a controversial bacterial genus belonging to the family Chlamydiaceae, order Chlamydiales, class/phylum Chlamydiae. Rickettsia is a genus of nonmotile, Gram-negative, nonspore-forming, highly pleomorphic bacteria that may occur in the forms of cocci 0.1 μm in diameter, rods 1–4 μm long, or threads of up to about 10 μm long. The term "rickettsia" has nothing to do with rickets, which is a deficiency disease resulting from lack of vitamin D; the bacterial genus Rickettsia was named after Howard Taylor Ricketts, in honour of his pioneering work on tick-borne spotted fever. Other groups of intracellular bacterial pathogens include Salmonella , Neisseria , Brucella , Mycobacterium , Nocardia, Listeria , Francisella , Legionella , and Yersinia pestis . These can exist intracellularly, but can exist outside of host cells. Bacterial pathogens often cause infection in specific areas of the body. Others are generalists. Bacterial vaginosis is caused by bacteria that change the vaginal microbiota caused by an overgrowth of bacteria that crowd out the Lactobacilli species that maintain healthy vaginal microbial populations. Bacterial meningitis is a bacterial inflammation of the meninges, that is, the protective membranes covering the brain and spinal cord. Bacterial pneumonia is a bacterial infection of the lungs. Urinary tract infection is predominantly caused by bacteria. Symptoms include the strong and frequent sensation or urge to urinate, pain during urination, and urine that is cloudy. The main causal agent is Escherichia coli . Urine is typically sterile but contains a variety of salts, and waste products. Bacteria can ascend into the bladder or kidney and causing cystitis and nephritis. Bacterial gastroenteritis is caused by enteric, pathogenic bacteria. These pathogenic species are usually distinct from the usually harmless bacteria of the normal gut flora. But a different strain of the same species may be pathogenic. The distinction is sometimes difficult as in the case of Escherichia . Erysipelas is an acute streptococcus bacterial infection  of the deeper skin layers that spreads via with lymphatic system. Cellulitis is a diffuse inflammation  of connective tissue with severe inflammation of dermal and subcutaneous layers of the skin. Cellulitis can be caused by normal skin flora or by contagious contact, and usually occurs through open skin, cuts, blisters, cracks in the skin, insect bites, animal bites, burns, surgical wounds, intravenous drug injection, or sites of intravenous catheter insertion. In most cases it is the skin on the face or lower legs that is affected, though cellulitis can occur in other tissues. Infections can be prevented by antiseptic measures such as sterilizing the skin prior to piercing it with the needle of a syringe and by proper care of indwelling catheters. Surgical and dental instruments are also sterilized to prevent infection by bacteria. Disinfectants such as bleach are used to kill bacteria or other pathogens on surfaces to prevent contamination and further reduce the risk of infection. Bacteria in food are killed by cooking to temperatures above 73 °C (163 °F). Many genera contain pathogenic bacteria species. They often possess characteristics that help to classify and organize them into groups. The following is a partial listing. This is description of the more common genera and species presented with their clinical characteristics and treatments. Of the 59 species listed in the table with their clinical characteristics, 11 species (or 19%) are known to be capable of natural genetic transformation. Natural transformation is a bacterial adaptation for transferring DNA from one cell to another. This process includes the uptake of exogenous DNA from a donor cell by a recipient cell and its incorporation into the recipient cell’s genome by recombination. Transformation appears to be an adaptation for repairing damage in the recipient cell’s DNA. Among pathogenic bacteria, transformation capability likely serves as an adaptation that facilitates survival and infectivity. The pathogenic bacteria able to carry out natural genetic transformation (of those listed in the table) are Campylobacter jejuni , Enterococcus faecalis , Haemophilus influenzae , Helicobacter pylori , Klebsiella pneumoniae , Legionella pneumophila , Neisseria gonorrhoeae , Neisseria meningitides , Staphylococcus aureus , Streptococcus pneumoniae and Vibrio cholerae . ↑ Relapsing fever can also be caused by the following Borrelia species: B. crocidurae , B. duttonii , B. hermsii , B. hispanica , B. miyamotoi , B. persica , B. turicatae and B. venezuelensis . - Barbour, Alan G. (2017). "Relapsing Fever". In Kasper, Dennis L.; Fauci, Anthony S. Harrison's Infectious Diseases (3rd ed.). New York: McGraw Hill Education. pp. 678–687. ISBN 978-1-259-83597-1. An antibiotic is a type of antimicrobial substance active against bacteria and is the most important type of antibacterial agent for fighting bacterial infections. Antibiotic medications are widely used in the treatment and prevention of such infections. They may either kill or inhibit the growth of bacteria. A limited number of antibiotics also possess antiprotozoal activity. Antibiotics are not effective against viruses such as the common cold or influenza; drugs which inhibit viruses are termed antiviral drugs or antivirals rather than antibiotics. Gram-positive bacteria are bacteria that give a positive result in the Gram stain test, which is traditionally used to quickly classify bacteria into two broad categories according to their cell wall. A biofilm comprises any syntrophic consortium of microorganisms in which cells stick to each other and often also to a surface. These adherent cells become embedded within a slimy extracellular matrix that is composed of extracellular polymeric substances (EPS). The cells within the biofilm produce the EPS components, which are typically a polymeric conglomeration of extracellular polysaccharides, proteins, lipids and DNA. Because they have three-dimensional structure and represent a community lifestyle for microorganisms, they have been metaphorically described as "cities for microbes". Streptococcus pyogenes is a species of Gram-positive bacterium in the genus Streptococcus. These bacteria are aerotolerant and an extracellular bacterium, made up of non-motile and non-sporing cocci. It is clinically important for humans. It is an infrequent, but usually pathogenic, part of the skin microbiota. It is the predominant species harboring the Lancefield group A antigen, and is often called group A streptococcus (GAS). However, both Streptococcus dysgalactiae and the Streptococcus anginosus group can possess group A antigen. Group A streptococci when grown on blood agar typically produces small zones of beta-hemolysis, a complete destruction of red blood cells. It is thus also called group A (beta-hemolytic) streptococcus (GABHS), and can make colonies greater than 5 mm in size. The human microbiota is the aggregate of microorganisms that resides on or within any of a number of human tissues and biofluids, including the skin, mammary glands, placenta, seminal fluid, uterus, ovarian follicles, lung, saliva, oral mucosa, conjunctiva, biliary and gastrointestinal tracts. They include bacteria, archaea, fungi, protists and viruses. Though micro-animals can also live on the human body, they are typically excluded from this definition. The human microbiome refers specifically to the collective genomes of resident microorganisms. Pseudomonas aeruginosa is a common Gram-negative, rod-shaped bacterium that can cause disease in plants and animals, including humans. 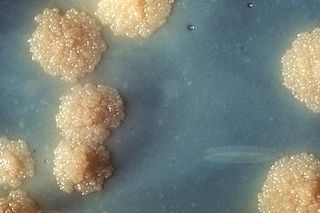 A species of considerable medical importance, P. aeruginosa is a multidrug resistant pathogen recognized for its ubiquity, its intrinsically advanced antibiotic resistance mechanisms, and its association with serious illnesses – hospital-acquired infections such as ventilator-associated pneumonia and various sepsis syndromes. Staphylococcus epidermidis is a Gram-positive bacterium, and one of over 40 species belonging to the genus Staphylococcus. It is part of the normal human flora, typically the skin flora, and less commonly the mucosal flora. It is a facultative anaerobic bacteria. Although S. epidermidis is not usually pathogenic, patients with compromised immune systems are at risk of developing infection. These infections are generally hospital-acquired. S. epidermidis is a particular concern for people with catheters or other surgical implants because it is known to form biofilms that grow on these devices. Being part of the normal skin flora, S. epidermidis is a frequent contaminant of specimens sent to the diagnostic laboratory. Gerald Domingue is an American medical researcher and academic who served as Professor of Urology, Microbiology and Immunology in the Tulane University School of Medicine and Graduate School for thirty years and also as Director of Research in Urology. He is currently retired and resides in Zurich, Switzerland, where he is engaged in painting and creative writing. At retirement he was honored with the title of Professor Emeritus at Tulane (1967–1997). Prior to Tulane, he served on the faculty of St. Louis University ; was a lecturer at Washington University and director of clinical microbiology in St. Louis City Hospital, St. Louis, Missouri. Streptococcus canis is a group G beta-hemolytic species of Streptococcus. It was first isolated in dogs, giving the bacterium its name. These bacteria are characteristically different from Streptococcus dysgalactiae, which is a human-specific group G species that has a different phenotypic chemical composition. S. canis is important to the skin and mucosal health of cats and dogs, but under certain circumstances, these bacteria can cause opportunistic infections. These infections were known to afflict dogs and cats prior to the formal description of the species in Devriese et al., 1986. However, additional studies revealed cases of infection in other mammal species, including cattle and even humans. Instances of mortality from S. canis in humans are very low with only a few reported cases, while actual instances of infection may be underreported due to mischaracterizations of the bacteria as S. dysgalactiae. This species, in general, is highly susceptible to antibiotics, and plans to develop a vaccine to prevent human infections are currently being considered. Streptococcus dysgalactiae is a gram positive, beta-haemolytic, coccal bacterium belonging to the family Streptococcaceae. It is capable of infecting both humans and animals, but is most frequently encountered as a commensal of the alimentary tract, genital tract, or less commonly, as a part of the skin flora. The clinical manifestations in human disease range from superficial skin-infections and tonsillitis, to severe necrotising fasciitis and bacteraemia. The incidence of invasive disease has been reported to be rising. Several different animal species are susceptible to infection by S.dysgalactiae, but bovine mastitis and infectious arthritis in lambs have been most frequently reported. Mycoplasma salivarium is a species of bacteria in the genus Mycoplasma. This genus of bacteria lacks a cell wall around their cell membrane. Without a cell wall, they are unaffected by many common antibiotics such as penicillin or other beta-lactam antibiotics that target cell wall synthesis. Mycoplasma are the smallest bacterial cells yet discovered, can survive without oxygen and are typically about 0. 1 µm in diameter. Mycoplasma salivarium is found in the mouths of 97% of the healthy population, and is generally considered to be a commensal organism and part of the normal oral flora. 1 2 Ryan, Kenneth J.; Ray, C. George; Ahmad, Nafees; Drew, W. Lawrence; Lagunoff, Michael; Pottinger, Paul; Reller, L. Barth; Sterling, Charles R. (2014). "Pathogenesis of Bacterial Infections". Sherris Medical Microbiology (6th ed.). New York: McGraw Hill Education. pp. 391–406. ISBN 978-0-07-181826-1. ↑ McFall-Ngai, Margaret (2007-01-11). "Adaptive Immunity: Care for the community". Nature. 445 (7124): 153. doi:10.1038/445153a. ISSN 0028-0836. PMID 17215830. 1 2 3 4 Santosham, Mathuram; Chan, Grace J.; Lee, Anne CC; Baqui, Abdullah H.; Tan, Jingwen; Black, Robert E. (2013). "Risk of Early-Onset Neonatal Infection with Maternal Infection or Colonization: A Global Systematic Review and Meta-Analysis". PLoS Medicine. 10 (8): e1001502. doi:10.1371/journal.pmed.1001502. ISSN 1549-1676. PMC 3747995 . PMID 23976885. ↑ Fish DN (February 2002). "Optimal antimicrobial therapy for sepsis". Am J Health Syst Pharm. 59 (Suppl 1): S13–9. doi:10.1093/ajhp/59.suppl_1.S13. PMID 11885408. ↑ Heise E (1982). "Diseases associated with immunosuppression". Environ Health Perspect. 43: 9–19. doi:10.2307/3429162. JSTOR 3429162. PMC 1568899 . PMID 7037390. ↑ Saiman L (2004). "Microbiology of early CF lung disease". Paediatr Respir Rev. 5 (Suppl A): S367–9. doi:10.1016/S1526-0542(04)90065-6. PMID 14980298. ↑ Belland R, Ouellette S, Gieffers J, Byrne G (2004). "Chlamydia pneumoniae and atherosclerosis". Cell Microbiol. 6 (2): 117–27. doi:10.1046/j.1462-5822.2003.00352.x. PMID 14706098. ↑ Terri Warren, RN (2010). "Is It a Yeast Infection?" . Retrieved 2011-02-23. ↑ Ferris DG, Nyirjesy P, Sobel JD, Soper D, Pavletic A, Litaker MS (March 2002). "Over-the-counter antifungal drug misuse associated with patient-diagnosed vulvovaginal candidiasis". Obstetrics and Gynecology. 99 (3): 419–425. doi:10.1016/S0029-7844(01)01759-8. PMID 11864668. ↑ "Urinary Tract Infections" . Retrieved 2010-02-04. ↑ "Adult Health Advisor 2005.4: Bacteria in Urine, No Symptoms (Asymptomatic Bacteriuria)". Archived from the original on 2007-07-12. Retrieved 2007-08-25. ↑ Greenwood, David; Barer, Mike; Slack, Richard; Irving, Will (2012). "Bacterial Pathogenicity". Medical Microbiology, a Guide to Microbial Infections: Pathogenesis, Immunity, Laboratory Investigation, and Control (18th ed.). Edinburgh: Churchill Livingstone. pp. 156–167. ISBN 9780702040894. 1 2 Tortora, Gerald J.; Funke, Berdell R.; Case, Christine L. (2016). "Microbial Mechanisms of Pathogenicity". Microbiology, an Introduction (12th ed.). Pearson Education. pp. 417–438. ISBN 978-0-321-92915-0. ↑ Nash, Anthony A.; Dalziel, Robert G.; Fitzgerald, J. Ross (2015). "Mechanisms of Cell and Tissue Damage". Mims' Pathogenesis of Infectious Disease (6th ed.). London: Academic Press. pp. 171–231. ISBN 978-0-12-397188-3. 1 2 Tortota, Gerard (2013). Microbiology an Introduction. ISBN 978-0-321-73360-3. ↑ Cassells AC (2012). Pathogen and biological contamination management in plant tissue culture: phytopathogens, vitro pathogens, and vitro pests. Methods in Molecular Biology. 877. pp. 57–80. doi:10.1007/978-1-61779-818-4_6. ISBN 978-1-61779-817-7. PMID 22610620. ↑ Yonath A, Bashan A (2004). "Ribosomal crystallography: initiation, peptide bond formation, and amino acid polymerization are hampered by antibiotics". Annu Rev Microbiol. 58: 233–51. doi:10.1146/annurev.micro.58.030603.123822. PMID 15487937. ↑ Khachatourians GG (November 1998). "Agricultural use of antibiotics and the evolution and transfer of antibiotic-resistant bacteria". CMAJ. 159 (9): 1129–36. PMC 1229782 . PMID 9835883. ↑ Keen, E. C. (2012). "Phage Therapy: Concept to Cure". Frontiers in Microbiology. 3: 238. doi:10.3389/fmicb.2012.00238. PMC 3400130 . PMID 22833738. 1 2 3 4 5 6 7 8 9 10 11 12 13 14 15 16 17 18 Unless else specified in boxes then ref is: Fisher, Bruce; Harvey, Richard P.; Champe, Pamela C. (2007). Lippincott's Illustrated Reviews: Microbiology (Lippincott's Illustrated Reviews Series). Hagerstown, MD: Lippincott Williams & Wilkins. pp. 332–353. ISBN 978-0-7817-8215-9. ↑ Kurzynski TA, Boehm DM, Rott-Petri JA, Schell RF, Allison PE (1988). "Comparison of modified Bordet-Gengou and modified Regan-Lowe media for the isolation of Bordetella pertussis and Bordetella parapertussis". J. Clin. Microbiol. 26 (12): 2661–3. PMC 266968 . PMID 2906642. 1 2 3 4 5 6 7 8 9 10 11 12 13 14 15 16 17 18 19 20 21 22 23 24 25 26 27 28 29 30 31 32 33 34 35 36 37 38 39 40 41 42 43 44 45 46 47 48 49 50 51 52 53 54 55 56 57 58 59 60 61 62 63 64 65 66 67 68 69 70 71 72 73 74 75 76 77 78 79 80 81 82 83 84 85 86 87 88 89 90 91 92 93 94 95 96 97 98 99 100 101 102 103 104 105 106 107 108 109 110 111 112 113 114 115 116 117 118 119 120 121 122 123 124 125 126 127 128 129 130 131 132 133 134 135 136 137 138 139 140 141 142 143 144 145 146 147 148 149 150 151 152 153 154 155 156 157 158 159 160 161 162 163 164 165 166 167 168 169 170 171 172 173 174 175 176 177 178 179 180 181 182 183 184 185 186 187 188 189 190 191 192 193 194 195 196 197 198 199 200 201 202 203 204 205 206 207 208 209 210 211 212 213 214 215 216 217 218 219 220 221 222 223 224 225 226 227 228 229 230 231 232 233 234 235 236 237 238 239 240 241 242 243 244 245 246 247 248 249 250 251 252 253 254 255 256 257 258 259 260 261 262 263 264 265 266 267 268 269 270 271 272 273 274 275 276 277 278 279 280 281 282 283 284 285 286 287 288 289 290 291 292 293 294 295 296 297 298 299 300 301 302 303 304 305 306 Fisher, Bruce; Harvey, Richard P.; Champe, Pamela C. (2007). Lippincott's Illustrated Reviews: Microbiology (Lippincott's Illustrated Reviews Series). Hagerstown, MD: Lippincott Williams & Wilkins. pp. 332–353. ISBN 978-0-7817-8215-9. 1 2 3 Epps SV, Harvey RB, Hume ME, Phillips TD, Anderson RC, Nisbet DJ (2013). "Foodborne Campylobacter: infections, metabolism, pathogenesis and reservoirs". International Journal of Environmental Research and Public Health. 10 (12): 6292–304. doi:10.3390/ijerph10126292. PMC 3881114 . PMID 24287853. 1 2 Bowden GHW (1996). Baron S; et al., eds. Actinomycosis in: Baron's Medical Microbiology (4th ed.). Univ of Texas Medical Branch. ISBN 978-0-9631172-1-2. (via NCBI Bookshelf). ↑ Baron, Samuel (1996). Medical Microbiology (4th ed.). University of Texas Medical Branch at Galveston, Galveston, Texas. ISBN 978-0-9631172-1-2. ↑ Rollins, David M. (2000). "BSCI424 Laboratory Media". University of Maryland. Retrieved 2008-11-18. ↑ Cain, Donna (January 14, 2015). 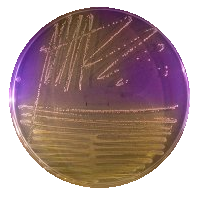 "MacConkey Agar (CCCCD Microbiology". Collin College. ↑ Gunn BA (1984). "Chocolate agar, a differential medium for gram-positive cocci". Journal of Clinical Microbiology. 20 (4): 822–3. PMC 271442 . PMID 6490866. ↑ Stevenson TH, Castillo A, Lucia LM, Acuff GR (2000). "Growth of Helicobacter pylori in various liquid and plating media". Lett. Appl. Microbiol. 30 (3): 192–6. doi:10.1046/j.1472-765x.2000.00699.x. PMID 10747249. ↑ Johnson RC, Harris VG (1967). "Differentiation of Pathogenic and Saprophytic Leptospires I. Growth at Low Temperatures". J. Bacteriol. 94 (1): 27–31. PMC 251866 . PMID 6027998. ↑ "Thayer Martin Agar (Modified) Procedure" (PDF). University of Nebraska-Medical Center, Clinical Laboratory Science Program. Retrieved 2015-05-03. ↑ "Hektoen Enteric Agar". Austin Community College District . Retrieved 2015-05-03. ↑ Cassell GH, Waites KB, Crouse DT, Rudd PT, Canupp KC, Stagno S, Cutter GR (1988). "Association of Ureaplasma urealyticum infection of the lower respiratory tract with chronic lung disease and death in very-low-birth-weight infants". Lancet. 2 (8605): 240–5. doi:10.1016/s0140-6736(88)92536-6. PMID 2899235. ↑ Pfeffer, C.; Oliver, J.D. (2003). "A comparison of thiosulphate-citrate-bile salts-sucrose (TCBS) agar and thiosulphate-chloride-iodide (TCI) agar for the isolation of Vibrio species from estuarine environments". Letters in Applied Microbiology. 36 (3): 150–151. doi:10.1046/j.1472-765X.2003.01280.x. PMID 12581373. ↑ "Yersinia pestis" (PDF). Wadsworth Center. 2006. 1 2 3 4 5 6 7 8 9 10 11 12 13 14 15 16 17 18 19 20 21 22 23 24 25 26 27 28 29 30 31 32 33 34 35 36 37 38 39 40 41 42 43 44 45 46 47 48 49 50 51 52 53 54 55 56 57 58 59 60 61 62 63 64 65 66 67 68 69 70 71 72 73 74 75 76 77 78 79 80 81 82 83 84 85 86 87 88 89 90 91 92 93 94 95 96 97 98 99 100 101 102 103 104 105 106 107 108 109 110 111 112 113 114 115 116 117 118 119 120 121 122 123 124 125 126 127 128 129 130 131 132 133 134 135 136 137 138 139 140 141 142 143 144 145 146 147 148 149 150 151 152 153 154 155 156 157 158 159 160 161 162 163 164 165 166 167 168 169 170 171 172 173 174 175 176 177 178 179 180 181 182 183 184 185 186 187 188 189 190 191 192 193 194 195 196 197 198 199 200 201 202 203 204 205 206 207 208 209 210 211 212 213 214 215 "Bacteria Table" (PDF). Creighton University School of Medicine. Archived from the original (PDF) on 2015-05-01. Retrieved 2015-05-03. ↑ Brook, I (Oct 2008). "Actinomycosis: diagnosis and management". Southern Medical Journal. 101 (10): 1019–23. doi:10.1097/SMJ.0b013e3181864c1f. PMID 18791528. ↑ Mabeza, GF; Macfarlane J (March 2003). 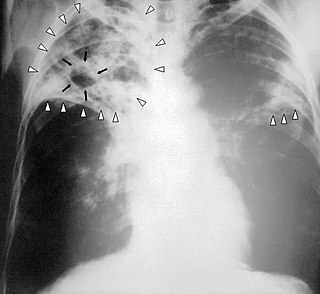 "Pulmonary actinomycosis". European Respiratory Journal. 21 (3): 545–551. doi:10.1183/09031936.03.00089103. PMID 12662015. ↑ "Anthrax in animals". Food and Agriculture Organization. 2001. ↑ "CDC Anthrax Q & A: Treatment" . Retrieved 4 April 2011. ↑ "FDA approves raxibacumab to treat inhalational anthrax" . Retrieved 14 December 2012. 1 2 Itzhak Brook (Jan 28, 2014). "Bacteroides Infection Follow-up". Medscape . Retrieved 2015-09-25. ↑ Shapiro ED (2014). "Clinical practice. Lyme disease". The New England Journal of Medicine. 370 (18): 1724–31. doi:10.1056/NEJMcp1314325. PMC 4487875 . PMID 24785207. 1 2 Sanchez JL (2015). "Clinical Manifestations and Treatment of Lyme Disease". Clinics in Laboratory Medicine. 35 (4): 765–78. doi:10.1016/j.cll.2015.08.004. PMID 26593256. ↑ Halperin JJ (2015). "Nervous System Lyme Disease". Clinics in Laboratory Medicine. 35 (4): 779–95. doi:10.1016/j.cll.2015.07.002. PMID 26593257. 1 2 3 4 5 6 Barbour, Alan G. (2017). "Relapsing Fever". In Kasper, Dennis L.; Fauci, Anthony S. Harrison's Infectious Diseases (3rd ed.). New York: McGraw Hill Education. pp. 678–687. ISBN 978-1-259-83597-1. ↑ Cutler SJ (2015). "Relapsing Fever Borreliae: A Global Review". Clinics in Laboratory Medicine. 35 (4): 847–65. doi:10.1016/j.cll.2015.07.001. PMID 26593261. ↑ Atkinson, William (May 2012). Tetanus Epidemiology and Prevention of Vaccine-Preventable Diseases (12 ed.). Public Health Foundation. pp. 291–300. ISBN 9780983263135. Archived from the original on 13 February 2015. Retrieved 12 February 2015. ↑ "Diphtheria vaccine" (PDF). Wkly Epidemiol Rec. 81 (3): 24–32. 20 January 2006. PMID 16671240. Archived (PDF) from the original on 6 June 2015. ↑ "ESCHERICHIA COLI". Public Health Agency of Canada. 2012-04-30. Retrieved 2015-06-02. ↑ Ryan, KJ; Ray, CG, eds. (2004). Sherris Medical Microbiology (4th ed.). McGraw Hill. ISBN 978-0-8385-8529-0. ↑ Slack, A (Jul 2010). "Leptospirosis". Australian Family Physician. 39 (7): 495–8. PMID 20628664. ↑ McBride, AJ; Athanazio, DA; Reis, MG; Ko, AI (Oct 2005). "Leptospirosis". Current Opinion in Infectious Diseases. 18 (5): 376–86. doi:10.1097/01.qco.0000178824.05715.2c. PMID 16148523. 1 2 Hartskeerl, Rudy A.; Wagenaar, Jiri F.P. (2017). "Leptospirosis". In Kasper, Dennis L.; Fauci, Anthony S. Harrison's Infectious Diseases. New York: McGraw Hill Education. pp. 672–678. ISBN 978-1-259-83597-1. ↑ "Leprosy Fact sheet N°101". World Health Organization. January 2014. Archived from the original on 2013-12-12. ↑ "Tuberculosis Fact sheet N°104". WHO. October 2015. Archived from the original on 23 August 2012. Retrieved 11 February 2016. ↑ Levinson, W. (2010). Review of Medical Microbiology and Immunology (11th ed.). pp. 94–9. ↑ "Syphilis - CDC Fact Sheet (Detailed)". CDC. 2 November 2015. Archived from the original on 6 February 2016. Retrieved 3 February 2016. ↑ Kent ME, Romanelli F (February 2008). "Reexamining syphilis: an update on epidemiology, clinical manifestations, and management". Annals of Pharmacotherapy. 42 (2): 226–36. doi:10.1345/aph.1K086. PMID 18212261. ↑ Hook EW (2017). "Syphilis". Lancet. 389 (10078): 1550–1557. doi:10.1016/S0140-6736(16)32411-4. PMID 27993382. ↑ Zhou D, Han Y, Yang R (2006). "Molecular and physiological insights into plague transmission, virulence and etiology". Microbes Infect. 8 (1): 273–84. doi:10.1016/j.micinf.2005.06.006. PMID 16182593. ↑ Wagle PM. (1948). "Recent advances in the treatment of bubonic plague". Indian J Med Sci. 2: 489–94. ↑ Meyer KF. (1950). "Modern therapy of plague". JAMA. 144 (12): 982–5. doi:10.1001/jama.1950.02920120006003. PMID 14774219. ↑ Kilonzo BS, Makundi RH, Mbise TJ (1992). "A decade of plague epidemiology and control in the Western Usambara mountains, north-east Tanzania". Acta Tropica. 50 (4): 323–9. doi:10.1016/0001-706X(92)90067-8. PMID 1356303. ↑ Bubeck SS, Dube PH (September 2007). "Yersinia pestis CO92ΔyopH Is a Potent Live, Attenuated Plague Vaccine". Clin. Vaccine Immunol. 14 (9): 1235–8. doi:10.1128/CVI.00137-07. PMC 2043315 . PMID 17652523.